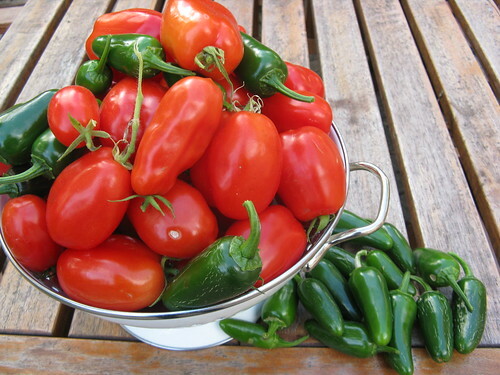 Things have quickly moved towards winter over the last two weeks & we've barely had a day over 50 F. Last week we had our first frost warning so I quickly harvested the last of the crop from our garden. But that still left a lot of green tomatoes on the vine. I hated to let those green tomatoes go to waste. I love green fried tomatoes but the type of tomato we grew is a paste tomato & not very good for just eating fresh. 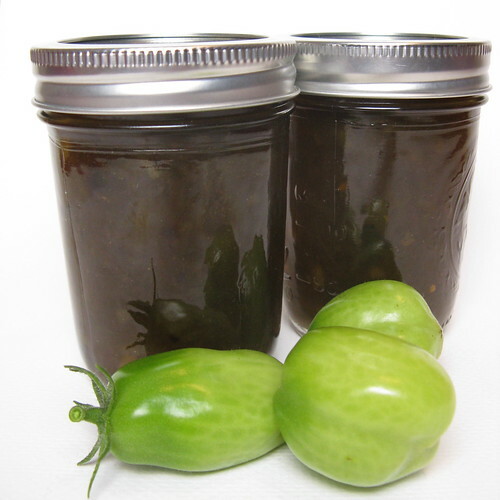 I seemed to remember hearing of green tomato jam so I started searching the web. Most of the recipes I found consisted of using a flavored jello saying that the finish product tasted like the other fruit. I knew that wasn't what I was looking for so the search continued. Well, then I found that Lori at Lori's Lipsmacking Goodness had made two versions of green tomato jam last year. Both sounded great, version 1 was flavored with vanilla & ginger while version 2 used ginger, allspice & cinnamon. Lori raved about version 2 saying her husband was eating it straight from the jar with a spoon so I figured that was the one to try. It really is tasty & I can't wait to try it over cream cheese on a cracker. This recipe does take 3 days (giving the tomatoes time to break down & get infused with the flavors) but its really not much work on days 1 & 2. Because of the amount of tomatoes we had I doubled the original recipe. I stuck to the recipe for days 1 & 2 but made some changes come day 3. First of all I put my tomatoes through my food mill to really break them down. Then Lori said the finished product had the consistency on corn or maple syrup but I wanted something a little thicker so I let it cook longer on day three. Our version wasn't as thick as a jam using pectin but a thick spread. Finally, I feel more comfortable with canning in a water bath compared to the method she uses so that's that I did. Day 1: Combine tomatoes, ginger, sugar and lemon juice in a large glass bowl. Cover the bowl & allow to sit overnight at room temperature. Day 2: The tomatoes should have releases a lot of liquid. Pour everything from the bowl into a large heavy bottomed pan. Add the cinnamon sticks & allspice. Bring to a boil. reduce heat & let simmer for 10 minutes. Pour everything back into a clean glass bowl. Refrigerate overnight. Day 3: Put the mixture through a food mill using the medium blade. Get as much through as possible. 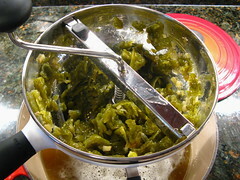 Then finely chop any skins that remain in the food mill. (If you don't have a food mill you could chop things finely in a food processor). Put everything in a large heave bottomed pot & bring to a boil. 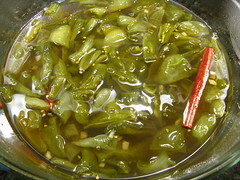 Reduce & let boil gently for 1/2 - 1 hours until thickened, it should reduce almost half. Meanwhile prepare 5 jars & lids for canning by boiling the jars in water at least 1-inch over the top of the jars for 20 minutes & the lids for 5 minutes. Remove hot jars from the water & fill with hot jam leaving 1/4-inch head room. Remove any air bubbles. Wipe the rims of the jars to clean any spilled jam. Top with lids & screw on neckbands. Return jars to the boiling water bath, with at least 1-inch of water over the top of the jars. Boil for 15 minutes. Turn off heat & let sit for 5 minutes. Remove jars from the water & let sit undisturbed for 12 hours. The tops of the jars should pull downward & pop, if any don't either reprocess that jar or refrigerate to use. Well what did you think of your final outcome? What was the consistency for you? I have been thinking I need to pull out one of these jars. Lori - The flavor is great, really tasty! Mine was thick but not as thick as jam with pectin in it. way to rescue those green stragglers, kat! next to frying 'em up, this is the best use for them! This is a very creative way to use those end of the season green tomatoes! Ooh! I have three large boxes of green tomatoes awaiting . . . something. It may be this. I love the addition of ginger in your jam. Such a great idea! Oooh, I bet I could still find some green tomatoes in the remnants of the garden. This sounds wonderful! I'm so jealous of your weather! I'm sure everyoen would think I'm crazy but I'm so tired of the heat - I'm ready for freezing cold! Love it! My 2yo and I are making Green Tomato Soup today based on a recipe I found in The NY Times, and I'll post later how it turned out. It's a wonderful thing (and respect) to use up everything in the garden. I've never had green tomato jam but I'm "all in"! I've been looking at our tomatoes thinking we need to pull them in fast - frost can't be far away! I'll be making a green tomato relish, but I have also had a (sweet) green tomato tarte tatin in the past that was delicious! 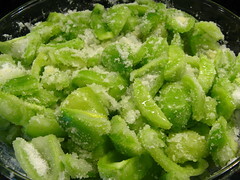 I just tried making a green tomato and jalapeno jam and it was pretty good. Another nice way to enjoy the green tomatoes. FINALLY a way to use up my green leftovers from the end of the season! This is going to be great! Bethany - I did it in 3 days because that is what the recipe said to do. You know I can't remember if anything changed overnight that night. Do you mean 5 1/5 cups sugar, or 5 1/2, please? It's 5 1/2 sorry about the typo.